Welcome to February. Between freezing temperatures and 30 knot winds, it’s been a trying month to get on the water consistently. And the expected onslaught of large schooling winter trout have been hard to find this year. There have been trout in the river and in deep holes in the creeks (especially Dallus) but even there the percentage of keepers is a little lower than usual winter fishing. Redfish, on the other hand, have actually been a little more active than most winters. They have a tendency to sit on the bottom and avoid any activity when it gets really cold, but there have been a number of very nice redfish taken, mostly in creeks. 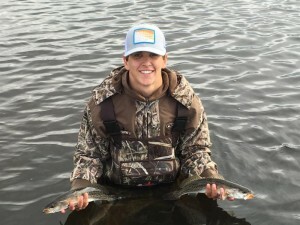 Later in the month when I went out the water temperature was 47 degrees on the flats and 49 degrees in the river; ordinarily that will bring large numbers of trout into the river. I still expect them to show up, and there are trout there to be caught, but culling through lots of undersize trout is the issue now. Even in Dallus Creek, which has lots of trout, we caught around 15 trout to find 3 keepers in about 90 minutes. Patience will get you limits as long as you can tolerate the cold. There have been some nice catches, as you can see from these pictures, but the fish are moving around and not staying in their usual haunts. 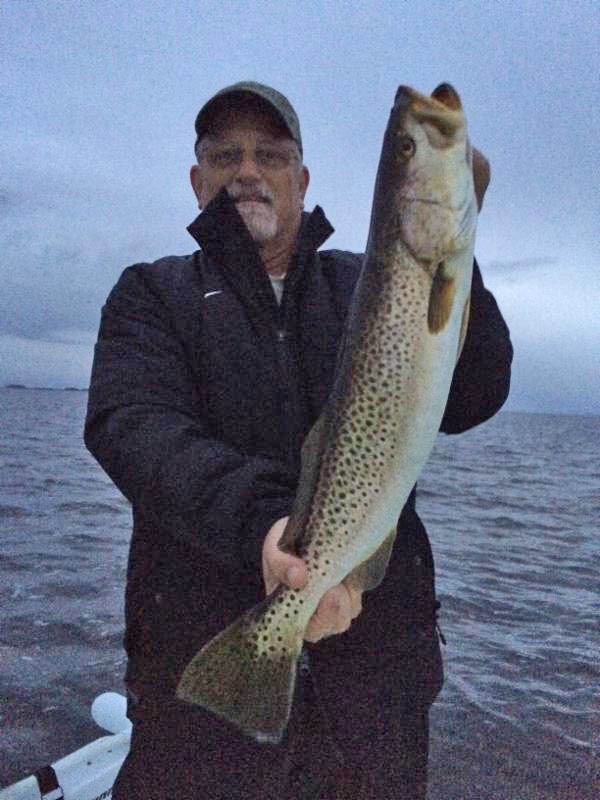 Terry Alexander found this true gator trout in deeper water. 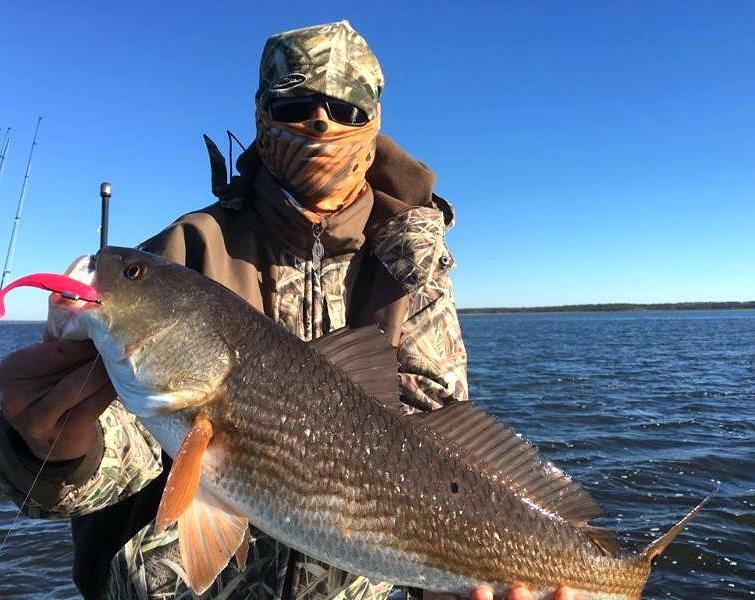 Chris Oliver with a beautiful overslot redfish. 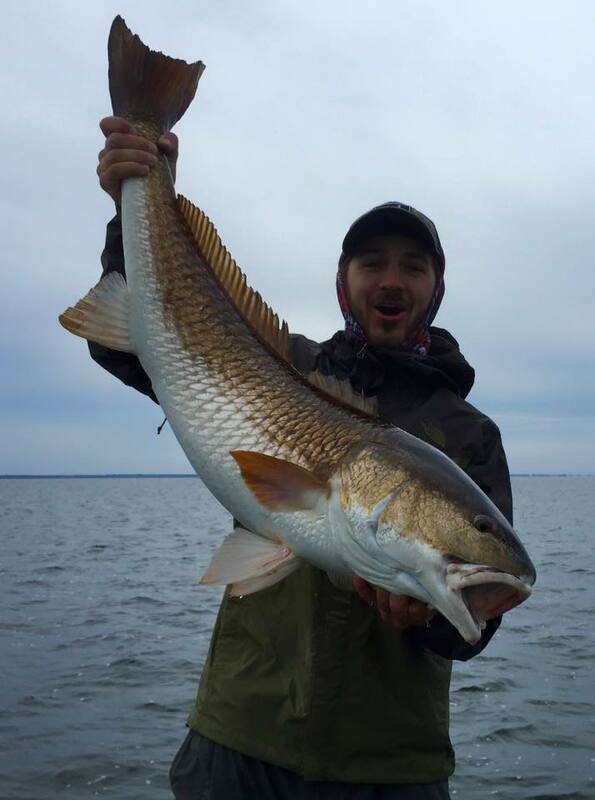 That’s Luke Matthews all bundled up with a redfish that also fell for a soft jerkbait. 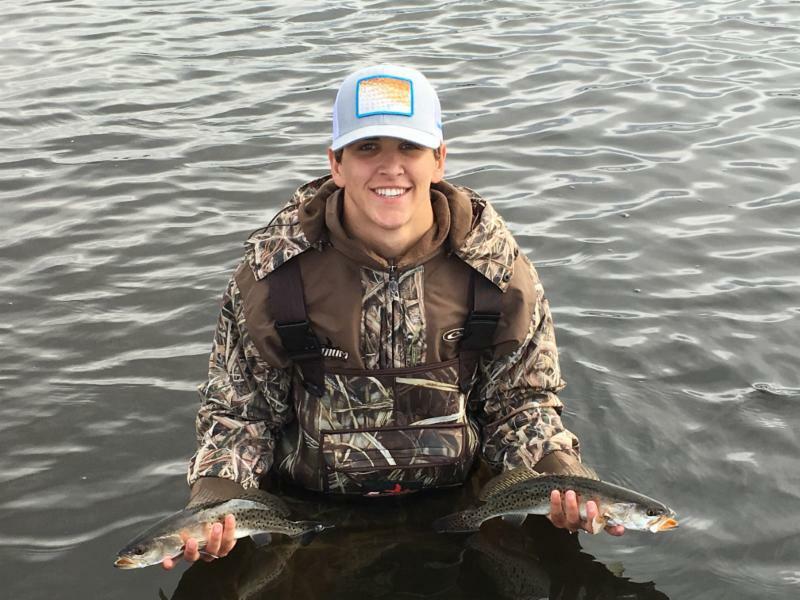 Luke Matthews did some wading in a creek and released these trout after finishing his limit. 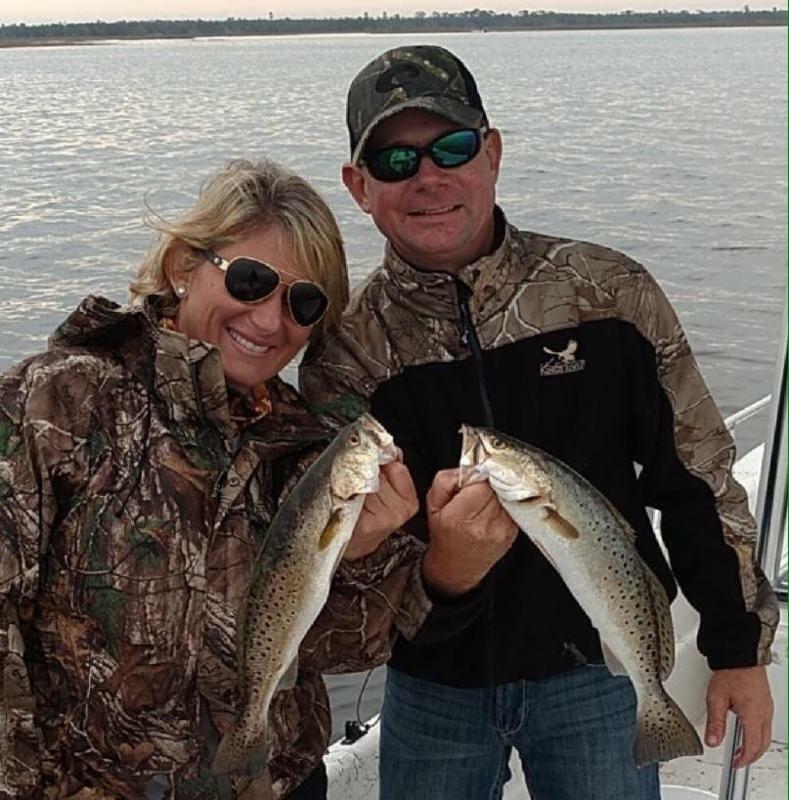 Kim Smith and Warren McGehee with a nice pair of trout. Adrian Rust with another fine gator. Brett Molzen with a nice pair of redfish; he had to release one to stay within his limit. 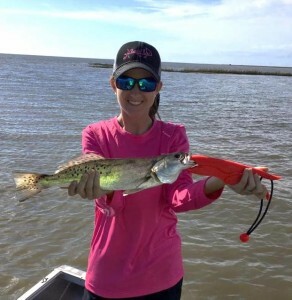 Brittany Rhoden found this nice trout on the flats. Blaine Smith with a great redfish. 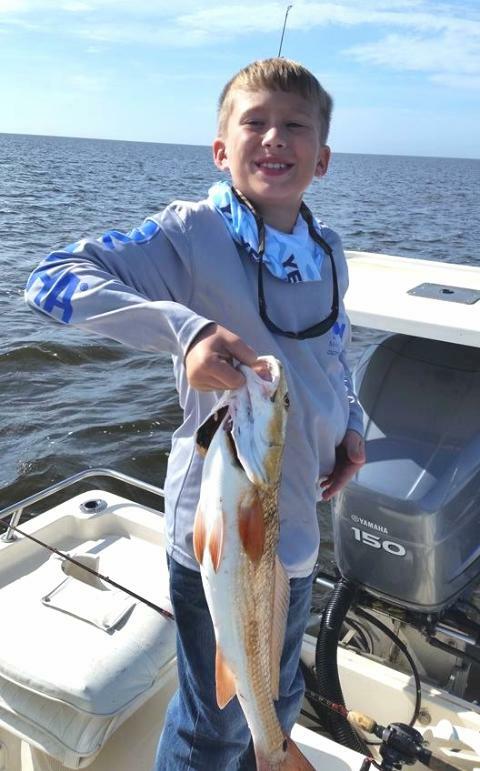 Elliot McDavid had an epic day fishing with over 30 redfish and a bunch of trout, anchored by this gator. He used a Gulp jerk bait rigged with a swimbait hook. Matt Huling nailed this overslot redfish on a jig. Garrett Smith and Chris Oliver with their redfish limits. 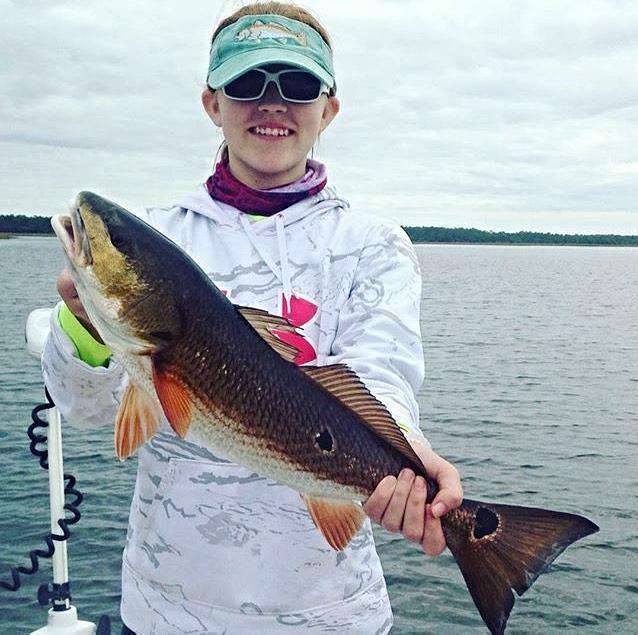 Abigail Moore also found a keeper redfish on the flats. Grant Wilson with a fine keeper trout. The best thing about February is that it’s no longer a closed month for trout fishing. And when the weather permits, the trout fishing can be excellent. 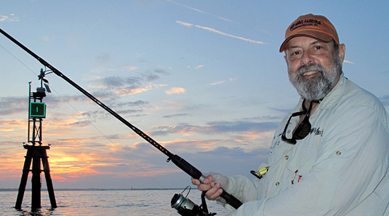 A few cold-water tips….this time of year, for more consistent action, use live shrimp. As someone who NEVER uses live shrimp unless forced, I can tell you that in very cold water, shrimp will outfish most artificials, and the number of robber pinfish is dramatically decreased. You may not catch giants, but more keeper trout are caught on shrimp than any other kind of bait during the winter months. 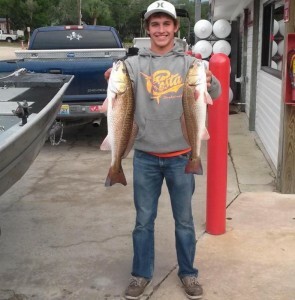 Same goes for redfish in creeks. 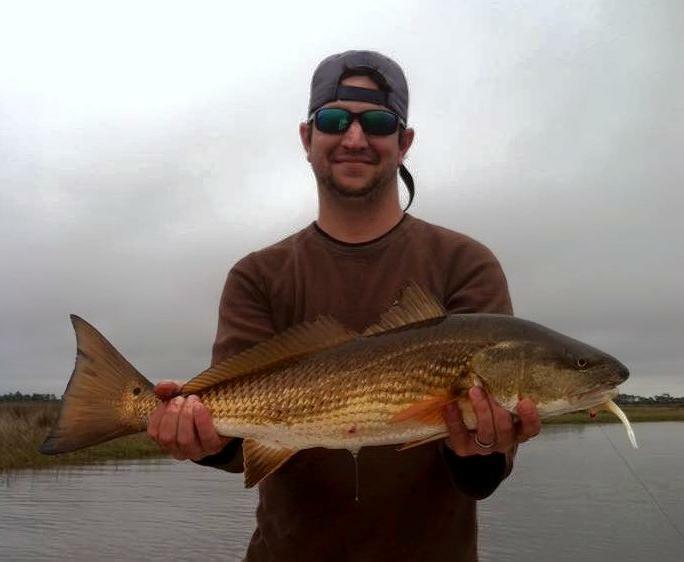 On flood tides, drift shrimp under a popping cork along marshgrass shoreline for the best shot at redfish. For larger trout, look for areas of warmth….deep water in the river, dark muddy bottom that will hold heat, and rockpiles….and concentrate on fishing in the afternoons after things warm up and the fish become more active. 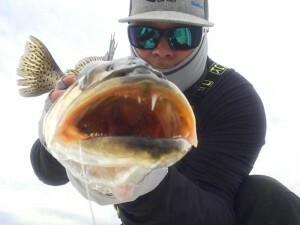 For larger trout, slowly suspending lures fished very slowly are the best bet, from 52M Mirrolures, to Paul Brown Lures, to some of the new Unfair lures will all provide action. If you like to move around, people have been doing very well with soft jerkbaits rigged on swimbait hooks. Recently the Slayer Sinister Swimtail has been scoring well, with their weighted hooks rigged weedless. Cast along edges of deep holes and shorelines, and oyster bars. Stop by the Ship’s Store to get live bait and the best selection of lures in town. 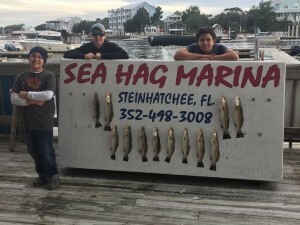 This is not the greatest time of the year for offshore fishing, with gag grouper being out of season, but any time now the sheepshead fishery will kick off, so be ready to run out to the reef or other offshore numbers. 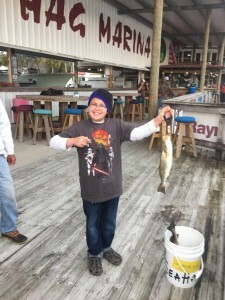 I’ll write more about sheepshead fishing next month. 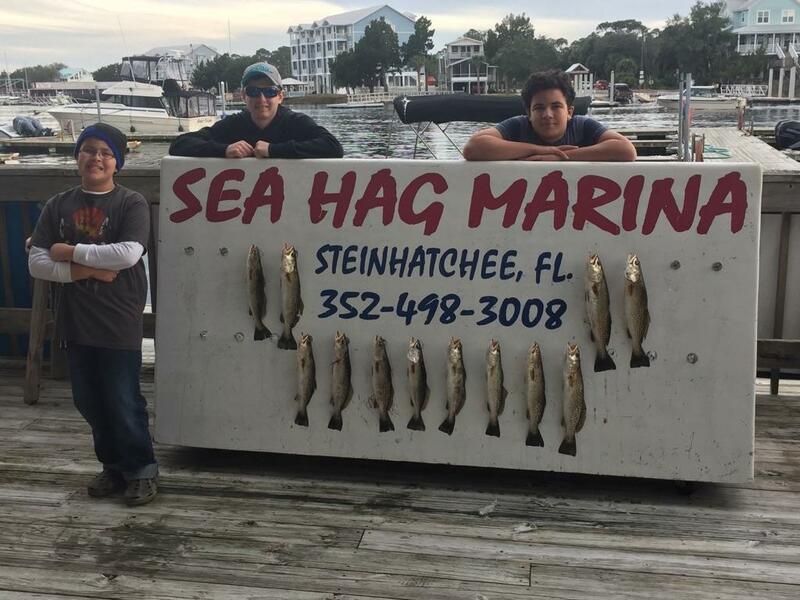 And if you want some of the best-tasting table fish you can get, run offshore to live bottom and load up with black seabass and Florida snapper. There are some large seabass available now. Tournament season kicks off this month, along with the legendary Fiddler Crab Festival. The Fiddler Crab tournament is dramatically expanded this year with multiple categories, so mark off the weekend of February 12th and 13th. 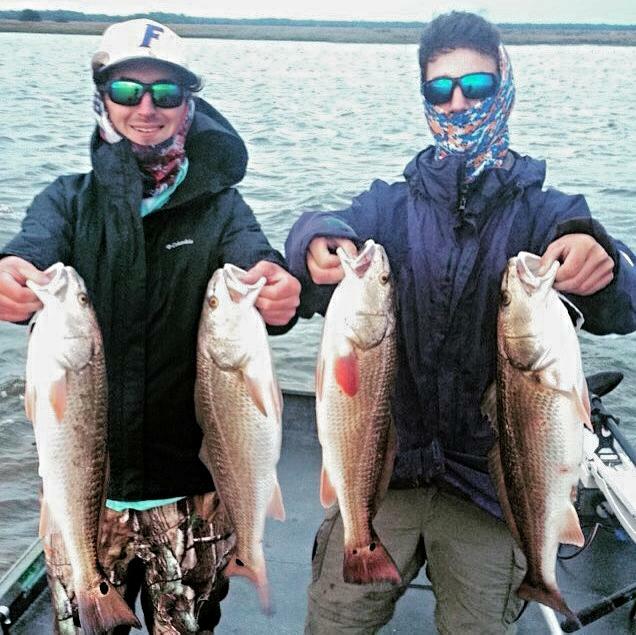 The Elite Redfish Challenge will be held at the Sea Hag on February 27th so if you want some competition that’s the place to find it. 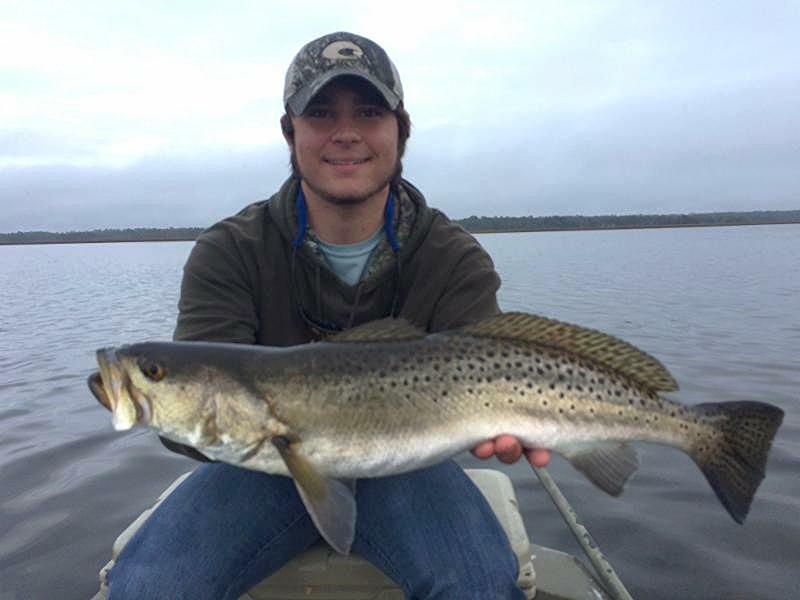 While the trout and reds are starting to move into creeks there are still trout and redfish to be found on the flats. 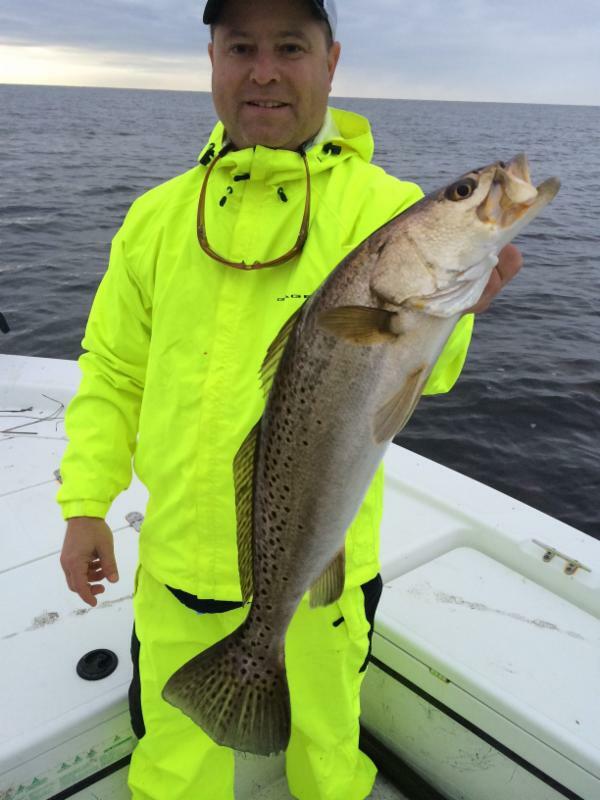 The backside of Dallus Creek and the Pepperfish channel continue to be the hot spots! They are out there you just have to find them!